Applications are now being invited for the Crawford Fund Queensland Committee’s International Training Awards program and Crawford-in-Queensland Student Awards. 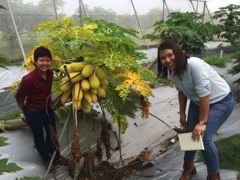 The Crawford Fund Queensland Committee is now inviting applications for training of eligible international scientists and extension staff under its International Training Awards program. The Crawford Fund Queensland Committee has for many years supported targeted training of overseas scientists and extension officers. Each year it will offer a small number of competitive grants of up to a maximum of $12,000 each for short-term training activities. Such activities may include conference and workshop attendance, short-term visits to other institutes, as well as areas of research, extension or governance/management training. Applications should be made by a Queensland-based host organisation. Applications are also being invited from both honours and postgraduate students interested in gaining more experience and expertise in international agricultural research. To help promote active engagement in IAR, the Queensland Committee of the Crawford Fund is offering each year a small number of competitive research funding awards for tertiary students. The purpose of the awards is to facilitate active student participation in IAR projects in order to help them gain valuable experience and expertise in IAR. Two types of award are available: Honours Research Scholarships and Postgraduate Student Awards. Applicants eligible for either award must already be enrolled at a recognised Queensland tertiary institute and engaged in a relevant biophysical or socio-economic aspect of agriculture, animal production, fisheries, forestry, natural resource management or food security. Professor Kaye Basford FTSE, Chair of the Crawford Fund Queensland Committee and Acting Head of the School of Biomedical Sciences at The University of Queensland, launched both Queensland awards at Parliament House on 15 February at the Queensland ‘Doing Well by Doing Good’ event. The closing date for award applications is COB Friday, 17 March 2017. Applications should be sent to the Queensland Coordinator for the fund, Dr Bruce Pengelly, at: bruce.pengelly@csiro.au. Click on the links for information about the recently launched South Australia, New South Wales, Western Australia and Tasmania State Committee student awards.